If you live in Australia, you may be wondering if it’s possible to buy e-cigarettes that contain nicotine. We have the answer that you’re searching for: yes, it is possible to buy nicotine vaping products in Oz, but there are some rules you need to follow in order to do so. 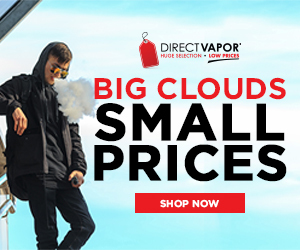 Below you will find all of the information that you need to buy nicotine e-cigs and e-liquid down under. Choose a vape starter kit that fits your needs and preferences. Add up to a 3-month supply of nicotine e-liquid to your cart and place your order. Once your order has been placed and processed, you’ll receive your nicotine vaping supplies within 3 to 5 days. That’s all there is to it. Yes, it is that easy to buy electronic cigarettes and nicotine e-juices if you live in Australia. 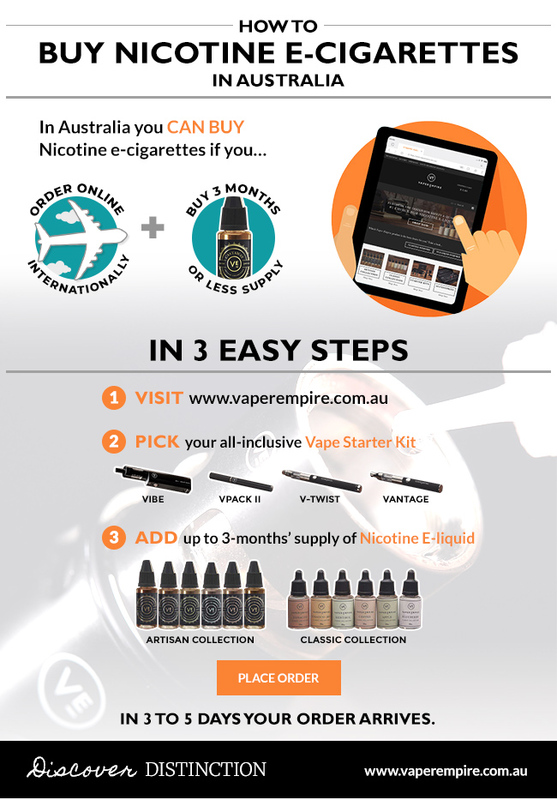 The reason why it’s so easy is that Vaper Empire is technically based outside of AU, which allows customers in Australia to legally import nicotine vaping supplies from their store. There is a catch though and that catch is this: you can’t order more than a 3-month supply of nicotine vape juice at one time and your order total can’t exceed $1,000 AUD. As the Australian government has yet to clearly define what exactly constitutes a 3-month supply of e-liquid, our advice to you is to exercise some caution when ordering. Don’t go overboard and too much, just get what you need to get through the next 3-months and you should be all set. Follow these rules and you’ll be vaping nicotine in just a matter of days. Vaper Empire, a vape brand serving customers in Australia since 2012, sells a range of premium electronic cigarette kits that include vape pens, cigalikes, and more. All Vaper Empire vape starter kits come with everything vapers need to get started, including e-liquid. When it comes to e-liquid, choices matter. That’s why Vaper Empire offers customers in Australia a wide selection of vape juice flavours to choose from. This includes ‘Classic’ flavours like Menthol, Cherry, and Tobacco, but also ‘Artisan’ flavours like Berry Chill and Spring in Siberia. All Vaper Empire e-juices are made in state of the art cleanrooms and manufactured to EU standards, ensuring a level of quality that’s worth of every dollar. Vaper Empire’s e-cigarettes are designed to be user-friendly, making them easy for vapers to use. Vaper Empire e-liquids are made from premium ingredients, are available with or without nicotine, and are available in a wide range of flavours. And the Vaper Empire vape shop is always open, providing vapers down under with easy access to premium vaping products no matter the day or time. Vaper Empire serves customers all across Australia, including Sydney, Brisbane, Melbourne, Adelaide, Gold Coast, New Castle, and Canberra. To visit Vaper Empire’s official online store, head on over to www.vaperempire.com.au and begin shopping today. Vaping vs. Smoking - Is it Better to Vape Than Smoke?